I really wasn't sure whether or not I'd like this book and sort of had a hard time working my way through it. 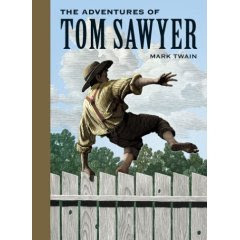 Tom Sawyer was rather a mischievous boy and a bit too troublesome for my tastes. On the one hand, his "innocence" in creating trouble was almost Anne-like (Montgomery) in nature. On the other hand, you spent most of the time wanting to give him a really good spanking. He sort of reminded me of a boy I grew up with who was bent on making trouble but still had enough charm about him to keep him out of it. Mostly. Publicly anyway. Tom is confusing. He's likable and frustrating at the same time. He doesn't think and most certainly doesn't care enough about his bad behavior to change it for the benefit of those around him. He lacks respect for his elders and is outright disobedient when he is told to do something that he doesn't want to do. However, Twain wrote the character so well that you can totally believe that Tom didn't actually mean to be bad -- he just was. So I spent a great deal of the book smiling through his shenanigans. I think that makes Twain a great author -- or at least in my book (pardon the pun)! He made me like an unlikeable. I don't go for kids who lack self discipline. However, I liked Tom in a cute sort of way. Certainly if he were my child I would have a great deal more to say about the things he said an did. But being that he is not, I can merely roll my eyes and try to understand that "boys will be boys" -- even though its frustrating (and even though I hate that statement as a general rule). I'm very glad to have finished this book and I'm really not sure that I wanted to go on and read more about Huckleberry Finn. Then again I'm curious. It's all a vicious cycle of likes and dislikes, I tell ya! This is on my reading list for this year. I probably read it 10 years ago and am curious to reread it again so I can go through a "refresher" course. I enjoyed your review. I think you'll find Huck Finn quite different in tone--Huck is at once less civilized and more mature, and the book is much more about social commentary and not boyhood pranks. So, shenanigans aside, did you get caught up in the adventure and wanderlust of it all???? I love what you said about Tom's behavior, it sounds like every boy I have ever met! It's only because of outside influence (GOD) that they turn into such wonderful men!